Reverse Image: Wreath with a shield on top. Comments: The transition from the Indian Head cent to the Lincoln cent took place during the middle of 1909. Please keep in mind, this is a highly-collectible coin. They should never be sold for melt value. 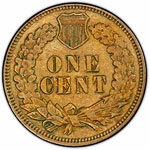 $0.0194183 is the melt value for the 1864-1909 Indian Head copper cent on April 25, 2019. The PCGS price guide on Indian cents has an updated list of certified coin prices. If you're interested in survival and rarity estimates (including the latest realized auction prices), also consider visiting PCGSCoinFacts.com. 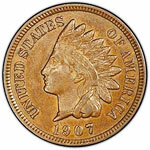 For example, they estimate there are only 8,800 known examples of the 1907 Indian Cent. This includes raw coins, those certified by PCGS, and those certified by other grading services.